Thornbury has a long and very distinguished history associated with cricket. 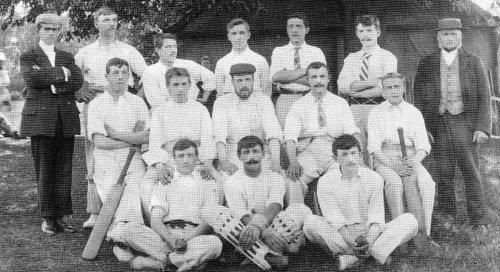 The Thornbury Cricket Club, as we know it today, was founded in 1871, although in 1850 an earlier Thornbury Cricket Club had combined with the Thornbury Phoenix Club to form the Thornbury United Cricket Club. In the earlier days the Cricket Club played in a field adjoining Park House, the home of their founder, Edward Mills Grace. This field was actually to the north of Park House and behind the butchers located on the High Street (now number 8 High Street). It was therefore on what is now the site of the home for people with physical disabilities built by John Grooms Housing Association. After the Club’s move to the Ship ground in Alveston in 1872 the field adjoining Park House continued being used as a practice pitch. A separate clu b, the Thornbury Castle Cricket Club was formed in 1880 and Sir Stafford Howard provided them with a pitch and pavilion in the grounds of Thornbury Castle. From descriptions of the ground in Edgar Mervyn Grace’s notes we assume that the ground was located on the ‘flattish’ field just outside the Western Gate of the Castle overlooking the River Seven. The Castle Cricket Club continued playing until 1919 when it amalgamated with the Thornbury Cricket Club. Another break-away team was formed in 1928 but it wasn’t long before the two teams amalgamated. We were lucky to have found Les Summerfield, who for many years has been associated with the Thornbury Cricket Club, both as a player and an active committee member. Les is now organising the archives of the club and and adding memorabilia and records donated by others. The Centenary Handbook also contained thumbnail sketches of the various characters associated with the club up to 1971. The content of these sketches and the rest of the handbook was based on notes by Edgar Mervyn Grace, the son of the Cricket Club’s founder and who himself had been associated with the club all of his life. We are grateful to Les, Thornbury Cricket Club and Edgar Mervyn’s grandson, Mike Grace, for allowing us to see and use the handwritten notes. The sketches included in the printed handbook were much shorter than those contained in Edgar’s notes. We have chosen to transcribe what Edgar wrote about each player as they contain some wonderful details. The notes also includes a list of the Club’s Presidents with thumbnail sketches of each. We have separated the profiles for members of the Grace family from the others. Twenty four members of the Grace family who played for Thornbury between 1871 and 1971, eleven of them were Doctors!